If this is your first time visiting our website, the veterinarians and staff of our animal hospital in Indianapolis would like to take the opportunity to welcome you and thank you for visiting. If you are a current client, we’d like to thank you for trusting us with your pet’s care. You've always known us as Michigan Road Animal Hospital through the years, and that has changed just slightly. We've tweaked our name just a little bit to keep it less confusing for our clients who visit our 96th Street office. But don't be worried! We are still made up of the same staff & are the same Michigan Road Animal Hospital you and your fur babies have come to know. We hope we meet and exceed your expectations as your pet’s veterinarian. 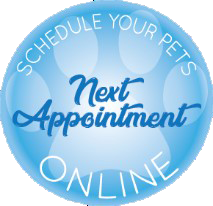 Current clients, don’t forget to sign up for a Pet Portal to access your pet’s records electronically, e-mail us, make appointments, & much more! 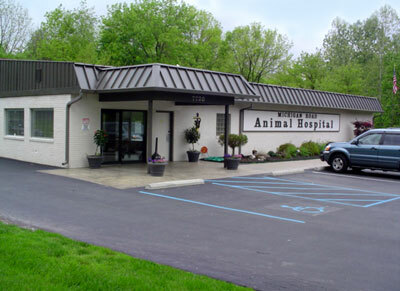 Michigan Road Animal Hospital at Crooked Creek in Indianapolis is a full service animal hospital for dogs and cats. We are happy to announce we are now a Certified Cat Friendly Practice! If you are in need of a veterinarian to take special care of your kitty, look no further. We take the stress out of bringing your cat to the vet. We offer special exam rooms dedicated to our feline friends! We also have cat friendly waiting rooms free of excessive noise, commotion, and smells. Click here for more info on our Cat Friendly Practice. If you are from around the Indianapolis area, we also have another location for you to find a great Indianapolis Veterinarian, just up the road at 96th Street & 465 - they are Michigan Road Animal Hospital @ 96th Street. If you live a bit north of our two hospitals, we encourage you to contact Zionsville Animal Hospital. All of our locations are here to serve you and your pets! 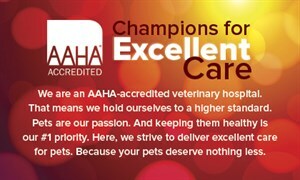 As part of our dedication to excellence our hospital has been accredited by the American Animal Hospital Association (AAHA) since 1963. This accreditation means we have met or exceeded AAHA's high standards of care regarding quality of medicine, accurate & secure medical records, as well as hospital design and equipment. You can be sure that all of the expertise, skill, and experience offered by our caring and friendly staff will be available for your pet's needs. If your pet is in need of a veterinarian for another reason not listed above, contact us - we can help! We understand that your pet is a very important member of the family. You can rest assured your pet will be in good hands because we are staffed by animal lovers whose mission is to practice outstanding medicine with the utmost care and concern. Michigan Road Animal Hospital is very proud of our recent recognition by Expertise.com as one of the top animal hospitals in Indianapolis. Out of the 267 veterinarians in the city who were reviewed, we were chosen as one of the best! Expertise.com connects people with first-rate, local experts. Their review process involves analyzing and scoring veterinarians on more than 25 variables across six categories to give you a hand-picked list of the best veterinarians in Indianapolis, IN. Dr. Alice Estes received her doctorate from the Purdue University School of Veterinary Medicine in 2008. She also joined the Michigan Road Animal Hospital @ Crooked Creek team in 2008. She is a member of the American Veterinary Dental Association. Dr. Estes has special interests in internal medicine, dentistry, and the human-animal bond. She lives with her husband, her two energetic dogs, Olive & Margaret, and their four cats--Samantha, Lola, Beatrice, and Georgia. Dr. Kirsty Jacobs grew up in Greenville, South Carolina, but considers herself to be a genuine Georgia Bulldog after receiving both her DVM degree in 2014 and her B.S.A. degree in Animal Science from the University of Georgia. She is excited to explore a different part of the country and to experience what living with snow is like. Her interests include preventive medicine, surgery and dentistry. In her free time, Dr. Jacobs enjoys running, hiking, water sports and spending time with family, friends, and her Beagle mutt, Millie and Golden Retriever, Lilly. Valarie graduated with a BS in Biological Sciences and minors in Counseling Psychology and Mathematics from Ball State University in 1997. 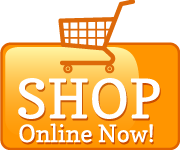 "Professional, affordable, knowledgeable. I highly recommend!"